Dream of living like a lost girl, but unsure how to take the big first step? After a yearlong trip traveling alone across three continents, author Stephanie Lee shares her RTW experience in The Art of Solo Travel: A Girl’s Guide. Written for anyone who was ever curious about exploring the world outside their cubicle, Lee’s first book covers not only the hows of traveling alone, but the whys and why nots. Tired of the rat race and restless for a taste of the world, Lee turned her wanderlust into reality by embarking on a journey spanning 20 cities in Asia, Africa and Europe. When preparing for the trip, Lee found existing guidebooks wanting and without much information tailoring to travelers like herself, despite an upsurge of women traveling solo in recent years. Gathering what she could from scattered resources, she packed her bag and leaped head-first, learning the rest on the way. The Art of Solo Travel, released on Jun. 1, is Lee’s 48-page call to any woman wanting to venture outside the 9-to-5 cycle to “quit your life and get a new one.” Lee is reassuring about safety concerns and gives a motivational push to potential travelers. Whether you want to travel for a couple weeks to a couple years, her book breaks down nearly all aspects of the voyage with useful tips for any stint away from home. If you’re a girl considering travelling alone, but are unsure of what to do next, think of this as a little companion to provide support. It should help you conquer any fears, doubts or anxieties you might have had when this “crazy” idea first crossed your mind. I hope sharing my experiences will inspire you to get out of that house/cubicle and take action – it’s time to stop dreaming your life and start living your dreams. While she delves into travel destination suggestions, offering her insights of the overall safety for women and ease of transportation, the book lacks the comprehensive knowledge about specific countries that Lee searched for when researching for her own trip. Her synopses of regions lack the understanding that cultural awareness and respect from the traveler’s end can keep her out of trouble in the most stereotypically ‘dangerous’ cities and countries, and that there are more significant factors than the reputation of more conservative or traditional places. The majority of the guide is Lee’s first-hand advice to all the daunting details: her one-bag rule, what you need and don’t need (ahem, too many shoes), ways to save up for your trip, realistic budgeting, couchsurfing with grace, how to maximize time at internet cafes and more. These sensible tips hold the guide together and are the best reason to download a copy into your eReader. The Art of Solo Travel truly reads like a travel companion. With its laid-back and conversational style, the book seems like Lee is alongside you offering her guidance personally. Ultimately, the book addresses what may be the largest obstacle holding women back from solo travel: loneliness on the road. Many guidebooks and web sites are silent on this aspect, so reading Lee’s take on the subject was refreshing. Her advice is optimistic and relieving for anyone anxious about the requisite spans of alone-time. She closes with a list of resources for those curious for more. Regardless, Lee unites practical advice with motivational inspiration in a way that would make any lost girl throw on a backpack and head out the door. The Art of Solo Travel may not answer all your questions while abroad, but its valuable advice makes it a must read for those of us daydreaming in our offices of whirlwind voyages. 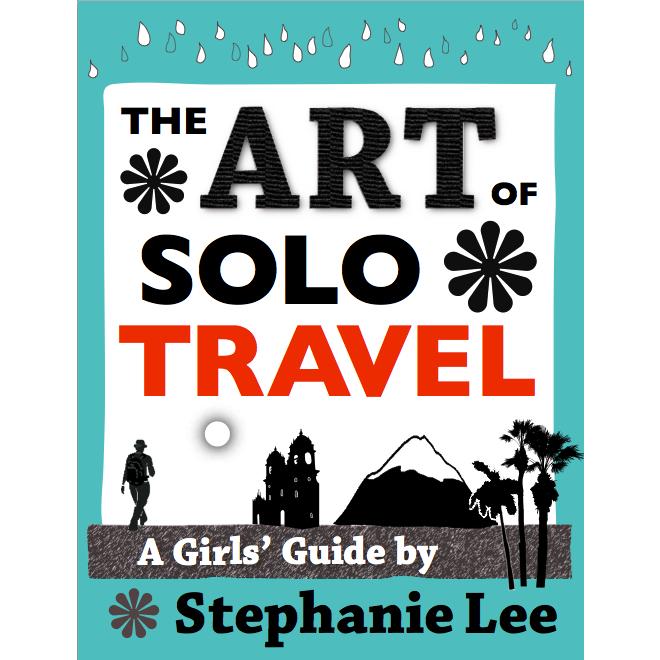 You can snag your very own copy of The Art of Solo Travel: A Girl’s Guide here. Anyone who signs up before the launch gets a 20% discount, so hurry on over and get your own!